Come experience a slice of Via Baci’s signature Neapolitan pizza (pictured left) or the made-from-scratch spinach artichoke dip (pictured right). I want to eat delicious food, and I am nearly always in a hurry. Every so often, these two things converge in a delicious way. Via Baci, just up the road in Lone Tree, has combined quick service with classic Italian food by embracing a very Italian way of thinking about eating – good ingredients make delicious meals. An 800-degree oven stands at the ready to quickly cook the restaurant’s signature Neapolitan-style pizza and other house favorites like Rosemary Chicken and Wood-Roasted Salmon. My personal favorite, though, is the Via Baci Chop salad. It’s full of tasty ingredients including fresh house-made mozzarella cheese and a Caesar dressing that tempts me to lick the plate every time I eat it. And though food is delivered efficiently, the atmosphere is anything but rushed. The sleek, modern interior of the restaurant and a tempting drink menu make it a perfect place to relax and enjoy the company of friends or family. For a sweet ending, McCleary recommends the tartufo, a locally-produced mixture of vanilla custard, chocolate mousse, cocoa and hazelnuts. Or, for a fun twist on the restaurant’s main-dish fare, try the Nutella pizza which features Nutella, honey, mascarpone cheese, strawberries and balsamic syrup. 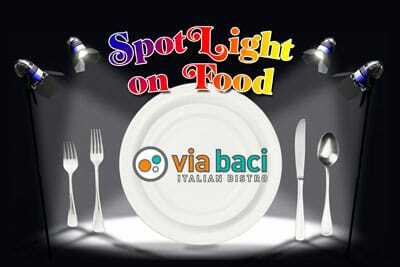 Via Baci is located at 10005 Commons Street in Lone Tree (in the Super Target Center). It is open for lunch and dinner everyday, from 11 a.m. until 9 p.m. weekdays and 11 a.m. until 10 p.m. on Friday and Saturday. Menu specials are offered daily, and most lunch pizza, pasta and entrees range from $9 to $12; dinner from $10 to $17. The holidays are coming, and Via Baci offers take out and party trays for entertaining. For more information, visit www.viabaci.com or call the restaurant at 303-790-0828.